The U.S. Air Force is looking to replace three aircraft — the E-4B command post, the C-32A executive airlifter and the Navy’s E-6B command post — under the purview of a single program known as NEAT. France is seeking to reduce its reliance on U.S. approval for French arms exports as Washington withholds clearance for an American component on the French Scalp cruise missile, which blocks the sale of additional Rafale fighter jets to Egypt. Leonardo DRS has received an additional $13 million to continue engineering and testing a vehicle-mounted system that the U.S. Army hopes will protect soldiers from small drones, according to a July 31 Defense Department statement. The defense industrial base study that President Trump ordered a year ago is nearing completion, a well-informed administration source told Breaking Defense. But the Executive Order 13806 study may come as a surprise: Instead of a sweeping agenda to restore America’s high-tech lead for future decades, the study will recommend near-term fixes to more mundane problems that could lose the U.S. a war if one broke out tomorrow. Sierra Nevada Corp believes that its offering of recapitalised Sikorsky UH-60A Black Hawk helicopters for the U.S. Air Force’s UH-1N replacement programme will be a winner because the service will have to spend less money acquiring data rights. Boeing is to begin development of a Block 3-standard Boeing CH/MH-47 Chinook transport and assault helicopter toward the end of the 2020s, ahead of fielding by the U.S. Army in the late 2030s/early 2040s. 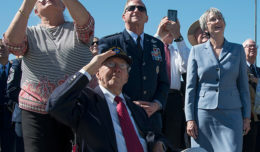 Senators gave final approval to the annual defense authorization bill Aug. 1, sending the $717 billion budget package to the White House to become law in the next few weeks. 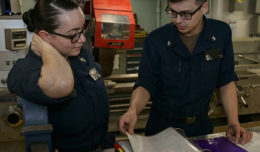 The Navy has pulled the trigger on the lucrative engineering services contract for afloat and ashore operations worldwide. The Navy’s North Dakota submarine has been certified for overseas deployment. The two U.S. amphibious warships that were planned to be central to the Rim of the Pacific 2018 exercises were unable to fully participate in the event due to mechanical failures that highlight continued readiness problems with the Navy’s amphibious fleet. Since late last year, a rash of unexplained physiological events such as hypoxia has caused dangerous breathing problems for pilots of T-6 Texan II training aircraft, and led to multiple groundings. Veterans Affairs officials strongly opposed legislative plans to extend disability payouts to roughly 90,000 veterans who claim exposure to Agent Orange during the Vietnam War, saying the move could set a problematic precedent for future benefits awards.